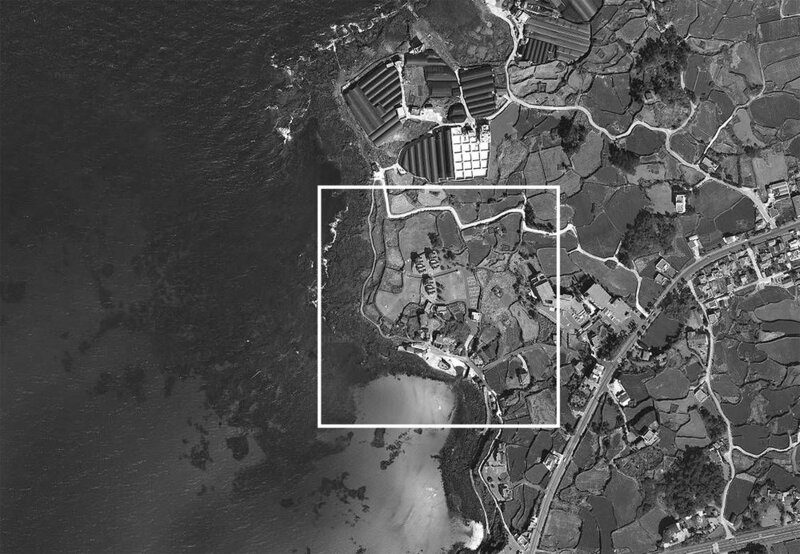 ‘platform_monsant’ project is located at a small residential area in Aeweol, Jeju, where quiet communities are situated far away from the cities. This area in Jeju Island is still holding the original characteristic of the volcanic island which has had broad open space and native plants. We hoped this building would be integrated to the surrounding landscape as a starting point of this project. 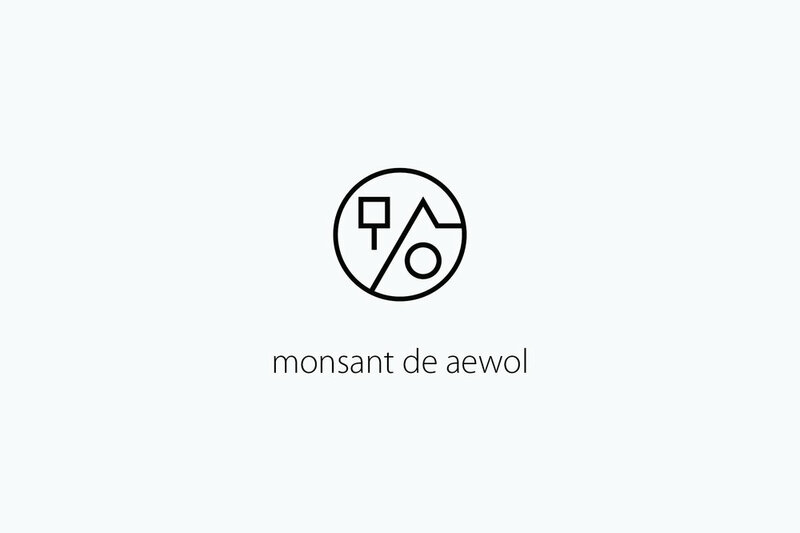 프로젝트 'platform_monsant'은 도심에서 멀리 떨어진 조용한 커뮤니티가 모여있는 애월의 작은 주거지역에 위치한다. 제주의 이 지역은 넓은 오픈 스페이스와 토착 식물들이 있는, 이 섬의 기원이었던 화산섬 조유의 특징을 여전히 유지하고 있다. 우리는 이 건축물이 주변의 풍경과 통합되길 바라였고, 이는 이 프로젝트의 시발점이 되었다. Our goal was not to emphasize the architecture by landscape, but to highlight the landscape by architecture. The existing nature reserve at the south and west of the site, and the steep downward hill oriented toward the back of the reserve enabled us to establish a direction of response: respecting the existing space by the least engagement, extending its permanence through the present toward the future. 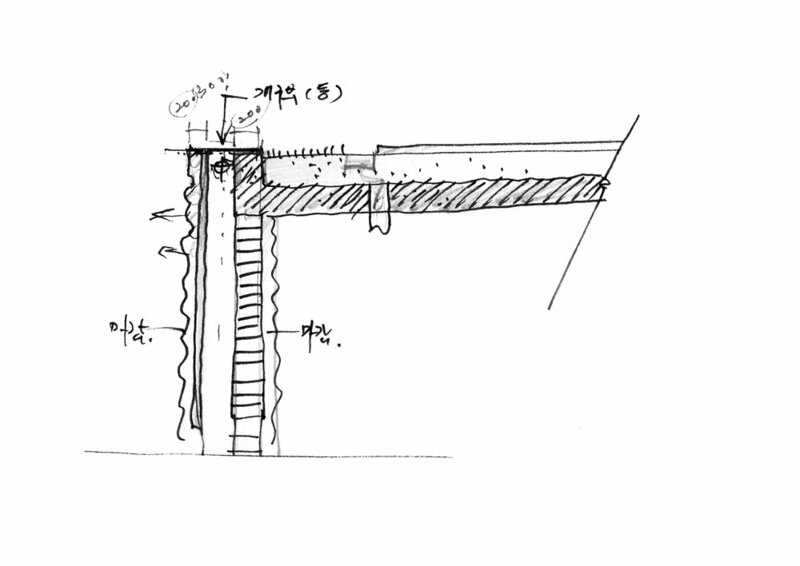 Here, architecture is no more or less than a medium to maintain and extend the existing context. 우리의 목표는 주변의 풍경을 이용해 건축을 강조하는 것이 아닌, 건축을 이용해 풍경을 강조하는 것이었다. 대지의 남측과 서측에 있는 기존의 자연보호구역과 그곳의 뒤쪽으로 향하는 급한 경사각의 내리막 언덕은 우리가 해답의 방향을 잡을 수 있게 하였다. 최소한의 개입을 통해 기존 공간에 대한 존중을, 그리고 이에 대한 영속성을 현재로 이어져 미래까지 연장시키는 것, 여기서 건축은 기존에 대한 컨텍스트를 유지, 연장시키는 매개체일 뿐 그 이상 그 이하도 아니다. 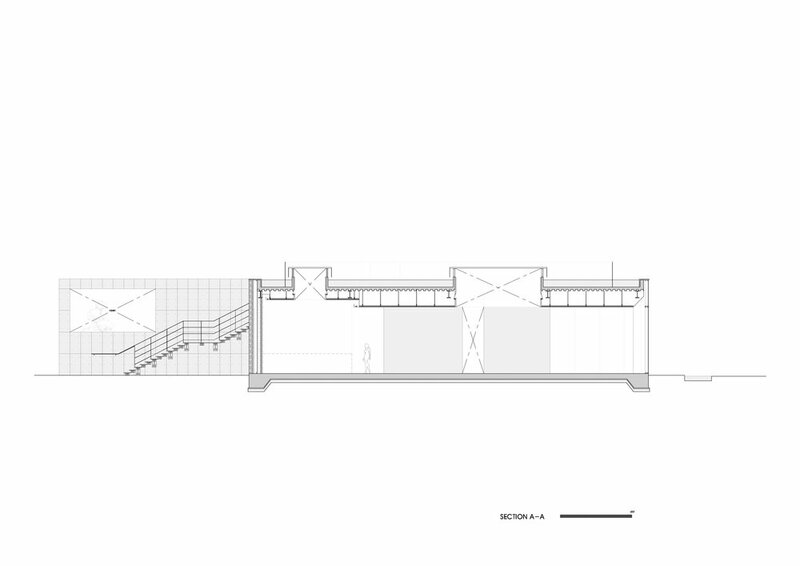 The building layout accepts the existing space and topography as it is, with the box form located along the slope as a simple volume for rest and contemplation. The refined volume is designed to embody a neutral piece of architecture through concrete and glass, thus offered as a device to absorb the characteristic of the existing site. 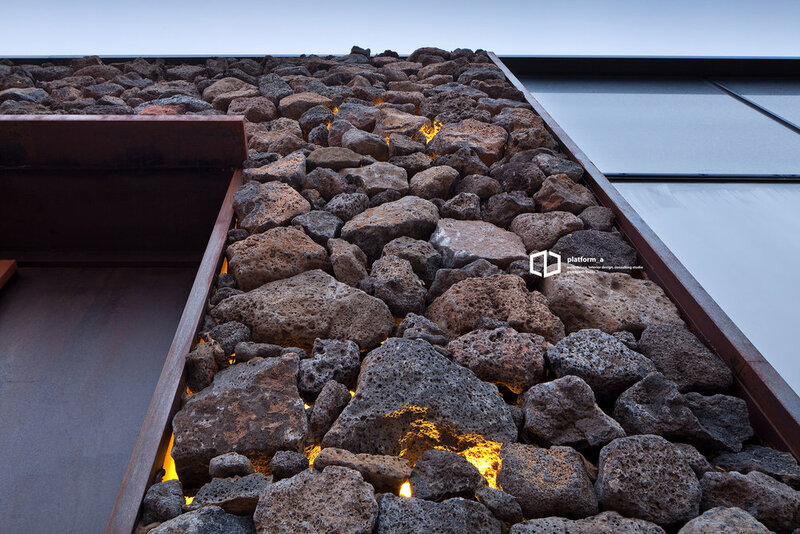 The contrast of basalt wall – an architectural material with locality given by nature – with the crushed concrete and the glass, delivers what story the building wants to speak of. 건축물의 배치는 기존 공간, 지형을 고스란히 받아들이며 경사지를 따라 휴식과 사색을 위한 사각 형태의 단순한 볼륨으로 위치시킨다. 정제된 볼륨의 디자인은 콘크리트와 유리를 통해 무채색의 건축으로 구현하여 기존 장소의 특성을 흡수하는 장치로 제공된다. 지역성을 갖고 자연에서 주는 건축자재인 현무암 담과 대비되는 부수어진 콘크리트와 유리는 이 장소에서 이 건축물이 어떠한 이야기를 하고 싶은지를 말해준다. We designed the first building of the whole master plan by constructing distinct horizontality along the north-south axis. The eastern and northern facades do not have windows, but the western and southern ones are mostly transparent. Also, the great windows connecting the inside and the outside are at once a functional device to ensure daylighting inside and the main medium to draw the outside (the beautiful sea and sunset of Jeju) close to the inside (artificial space for users). The windows can be closed in a row or not, i.e. whether they are opened or not determines the character of space as implicative or extensive, thus creating a new paradigm and relationship between the building and the site. 우리는 남북으로 향하는 뚜렷한 수평적 구성을 통해 전체 마스터플랜 상의 첫 번째 건축물을 계획했다. 동측과 북측 파사드는 창이 없으나 서측, 남측 파사드는 대부분 투명하다. 그리고 이 공간의 내외부를 연결하는 거대한 창문은 내부에 자연채광을 화보하는 기능적 장치인 동시에 외부(제주의 아름다운 바다와 석양)과 내부(사용자를 위한 인공적인 공간)을 밀착시키는 주요한 매개체로 적용된다. 창문은 일렬로 이루어질 수 있고 아닐 수도 있는데, 개폐 유무에 따라 함축적 공간 또는 확장된 공간으로 변화시켜 건물과 대지의 새로운 패러다임과 관계를 만들어 낸다. The roof terrace of the single-story building extends the surrounding environment, serving as an observatory open in all directions. Also, it is responsible for the building insulation all year round, augmenting the visual continuity between the road, the house, and the site. On the roof terrace, a translucent cube as an extension of the skylight inside plays such functional roles as actively projecting the temporally-changing daylight into the inside, while emanating the artificial light inside into the terrace outside at night. 단층으로만 계획된 건축물의 옥상정원은 주변 환경을 연장해주며, 사방으로 열린 전망대의 역할을 한다. 또한, 일 년 내내 건물의 단열을 담당하고 도로, 주택, 대지 간의 시각적 연속성을 강화시켜준다. 옥상정원에는 내부에서의 천창이 그대로 이어진 반투명 큐브가 시간의 흐름에 따라 변화하는 빛의 흐름을 적극적으로 내부로 투영시키고 야간에는 내부의 빛을 테라스가 있는 외부로 발산하는 기능적 역할을 수행한다. Back wall _ This great, tough, and attractive concrete was reborn with strong inspiration from the site. This is a transformation into an artwork, or a main intervention to extend toward the inside, having a distinct character of roughness. The wall escapes from the existing role of a boundary and now offers a new space where users can take a rest, while the vertical axis planned along the wall arouses the users' curiosity as well as making them look upward and their movement go toward a new space. back wall _ 단층으로거대하고, 강인하고, 매혹적인 콘크리트로 대지에서 강하게 영감을 받아 재탄생했다. 이는 예술작품으로의 변형으로써, 또는 내부로 확장하려는 주요한 간섭으로써 가공되지 않은 뚜렷한 성격을 가진다. 기존의 경계로써 역할만을 했던 벽은 이용자들을 위한 새로운 휴식공간을 제공하고, 벽을 따라 계획된 수직축은 사용자들의 호기심을 유발하는 동시에 시선을 위쪽으로 이동시켜 적극적으로 새로운 공간으로의 동선을 유도한다. Reflecting glass _ The great reflecting glass made of black stainless-steel frame was designed to enable opening or closing by the time of day, fending off the view from outside as well as preventing the views of users inside and outside from crossing each other, thus providing those inside with free environment where they can take a special rest in the projection of beautiful landscape of surrounding nature. reflecting glass _ 블랙 스테인리스 프레임으로 이루어진 거대한 반사유리는 시간에 따라 개폐가 가능하도록 계획되었어며 외부에서 내부로의 시야를 막는 동시에 내외부 사용자 간의 시선의 겹침을 막아 자유로운 환경을 제공하고, 특별한 휴식을 보내 수 있도록 주변에 둘러싸여진 아름다운 자연 풍경을 투영한다. 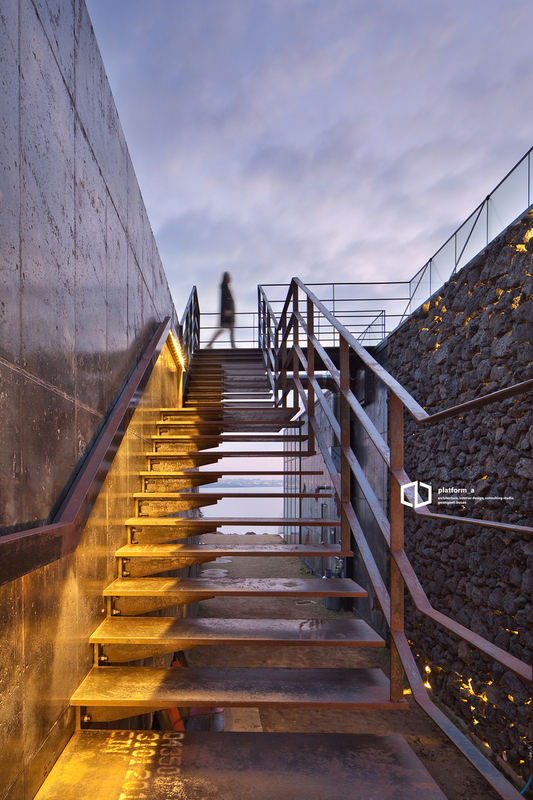 Reflection of external environment in the inside _ Such beautiful landscape elements reflecting the locality of Jeju as stone wall, volcanic sand, and basalt rock were reinterpreted into the motif of this project. The trace of the existing site hollowed inside the southern floor serves as a device of awakening a primitive sense of nature and as a medium to accept its ceaseless change. Avoiding formalized actions and ideal predictions on architecture, this project encounters nature through the void space in a meaningful relationship, not in any superficial dimension of information. reflection of external environment in inside _ 돌벽, 화산사, 현무암 등 제주도의 지역성을 가지는 아름다운 자연 풍경을 모티브로 재해석하였으며, 남측 내부 바닥면에 파여진 기존 대지의 흔적은 자연의 원초적인 감각을 일깨우는 장치이자, 지속적인 자연의 변화를 받아들이는 매개체로써 역할을 수행한다. 건축에 관한 근본적인 행동과 생각의 예상을 피하고, 건축의 빈 공간을 통해 피상적인 정보의 차원이 아닌 자연과 의미 있는 관계를 맺으며 조우한다.